Did Honest Abe Use a Fountain Pen? Looks like a dip pen to me. Could it be a fountain pen? 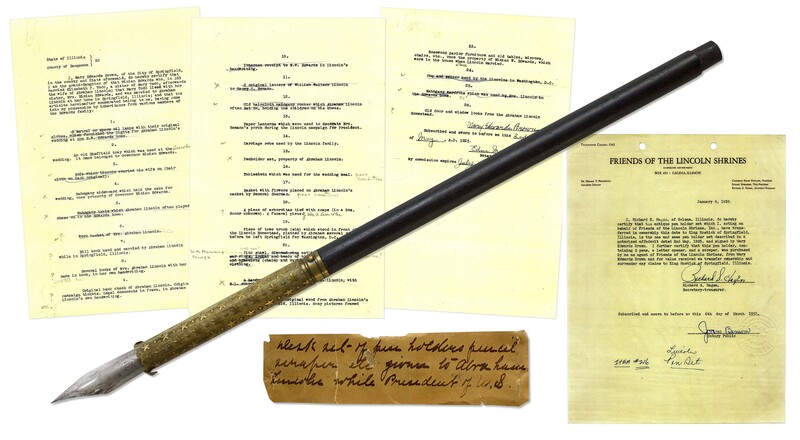 Extraordinary collectible from the Presidency of Abraham Lincoln, a personally owned and used pen by Lincoln, given to him during his service as President. Steel-nib fountain pen, lightly worn from use, is evocative and notable for the gold-colored star pattern upon its barrel, calling forth the patriotic Union sentiment at the heart of the Civil War, clearly intended to inspire the President and reminding him of the War’s noble and patriotic purpose. Pen has been identified as part of a set inherited by Mary Edwards Brown, Mary Todd Lincoln’s grandniece who famously served as Custodian of the Lincoln Homestead in Springfield, Illinois. The pen is listed as one of the items in a 2 May 1925 notarized affidavit signed by Brown as number ”15. Penholder set, property of Abraham Lincoln”, a copy of which accompanies the pen. This affidavit was created by Brown to accompany the sale of the pen to Richard Hagen of Friends of the Lincoln Shrines, whose 1958 notarized affidavit copy also accompanies the pen, created when it was sold to noted Lincoln dealer King Hostick; affidavit reads in part: ”the antique pen holder set…is the one and same pen holder set described in a notarized affidavit dated 2nd May, 1925, and signed by Mary Edwards Brown. I further certify that this pen holder, containing 2 pens, a letter opener, and a scraper, was purchased by me as agent of Friends of the Lincoln Shrines, from Mary Edwards Brown”. Finally the pen is accompanied by the original handwritten note by Mary Edwards Brown reading, ”Desk set of pen holders pencil scraper etc. given to Abraham Lincoln while President of U.S.” This note has been authenticated by University Archives as written by Brown and matching the writing on her 1925 affidavit; the 1925 affidavit was provided by Daniel Stowell, former director of the Papers of Abraham Lincoln Project. University Archives COA also accompanies the lot validating the authenticity of the pen as originally owned by Abraham Lincoln and as one of the pens in the set described in the three documents. Pen (not including ink cartridge) measures 7.25” long. Light scratching to the nib from use, and some light rubbing to the barrel. Overall in near fine condition, an evocative piece from Abraham Lincoln, likely used for importance during the Civil War. A fountain pen that was given to Abraham Lincoln while he was president has sold for more than $41,000. CHICAGO (AP) — A fountain pen that was given to Abraham Lincoln while he was president has sold for more than $41,000. Nate D. Sanders Auctions in Los Angeles says in a news release that the pen was sold last week. According to the auction house, the steel-nib fountain pen has a gold-colored star pattern on its barrel that was intended to remind Lincoln about the “noble and patriotic purpose” of the Civil War. The auction house says the pen was inherited by Lincoln’s grandniece who was also the custodian of Lincoln’s home in Springfield. The grandniece, Mary Edwards Brown, sold the pen in the 1920s and then it was sold yet again in the late 1950s to a Lincoln memorabilia dealer. The release includes no information about the pen’s new owner.